At R.D. Scinto, we have thought of almost everything to ensure our tenants have all the convenience readily available to them. We make a wide range of on-site amenities available to every tenant. Put on your whites and enjoy use of the new tennis courts, free of charge! Reserve a time slot by emailing tennis@scinto.com. Complimentary lessons available during the season. Dressed to the Nines is Connecticut’s very own custom clothier and shirt-maker. We provide men in Fairfield and surrounding Connecticut counties with upscale and specialty clothing items. Dressed to the Nines by Bob Degemmis offers the professional man an extraordinary opportunity to design, personalize, and customize high-end suits by working with the most exquisite fabrics, leather goods and accessories to build the perfect ensemble. Plates bursting with color and flavor, wonderful aromas, fresh ingredients, and of course the joy of tasting the amazing food: it’s all here at Il Palio by Margherita Aloi. Our on-site auditorium holds 200 people and is available for tenant’s use. Please email auditorium@scinto.com for reservations. 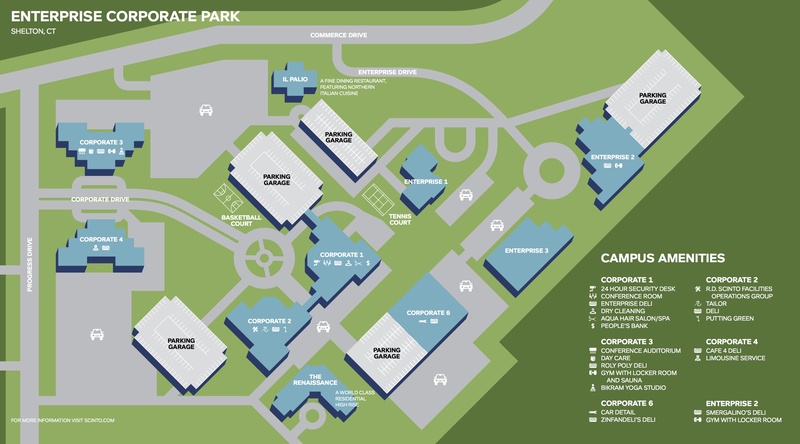 The Enterprise Corporate Park basketball court is located in front of the Tower 1 parking garage. Use of the court is free for tenants and does not require a reservation – simply bring a ball and shoot some hoops! Bright Horizons is an early learning center that focuses on hands-on experience and active participation, through the use of an engaging curriculum and knowledgeable child care specialists. Ages served: infants, toddlers, preschool, pre-kindergarten, and kindergarten. Modern and innovative meets classic chic at Aqua Salon and Spa. We provide an array of professional hair, beauty, and spas services with the latest technologies performed by our talented team. Bikram Yoga Shelton holds 19 hot yoga classes per week. The traditional 26 posture series is taught by caring instructors who guide all levels of ability, in a 103˚ room for 90 minutes. Visit the website for to view the full class schedule. Come prepared to stretch your mind and body… and sweat! Free rounds of golf at Brownson Country Club are available to our tenants. Call 203-929-6300 for reservations. Limit of 8 people per day. Simonetti Cleaners has been dry cleaning for over 55 years. As a family-owned business, they specialize in personalized, quality service. The Enterprise Corporate Park location will gladly handle all your dry cleaning needs, conveniently located next to your work for easy drop-off and pick-up. People’s United Bank. Member FDIC. Our tenants can use rooftop terrace atop the Renaissance residential tower, located at the Enterprise Corporate Park. Please call R.D. Scinto reception at 203-929-6300 for reservations and reservation policies. Pumpkin Preschool is a year-round, full service early learning center with a nurturing staff and creative curricula that caters to R.D. Scinto tenant families. Car wash and detail service. Jarred salads, fresh panini, homemade soups, nutritional broths, and a selection of healthy and gluten-free baked goods. Relax and unwind with a trip to the meditation cube. The Executive Conference Room is located in 1 Corporate Drive on the first floor next to the Security Desk. It holds up to 20 people. The 35 Nutmeg Conference Room is located in the building near Taste Garden Cafe. It holds up to 65 people.